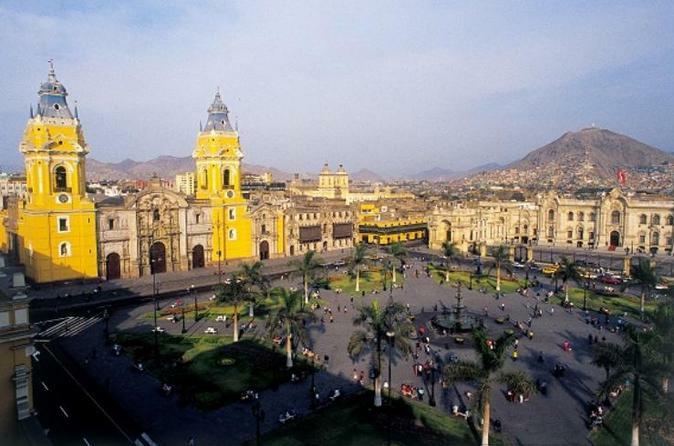 Enjoy a complete tour of the beautiful cultural town of Lima, also know as the City of Kings. You’ll see classic historical sights, colonial and Inca influenced architecture, residential neighborhoods, beautiful shrines and churches and incredible panoramic seascapes. You'll be able to see Lima through the eyes of a local and feel at home for the rest of your stay in Peru! 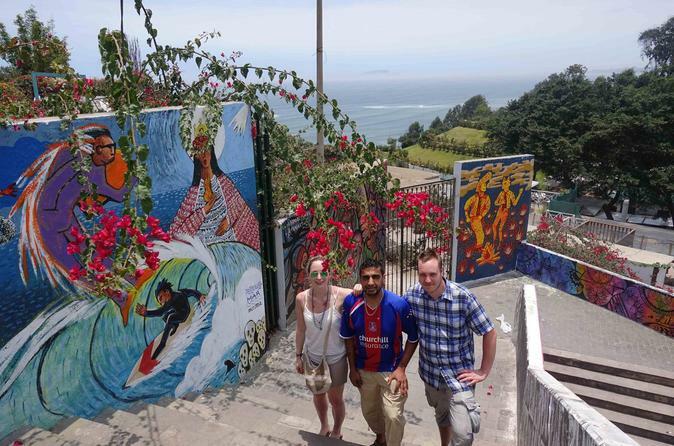 There's no better way to explore Lima than on a small group walking tour! Try out some Spanish greetings, stroll around the central market, try pisco sour and explore the Monasterio San Francisco. 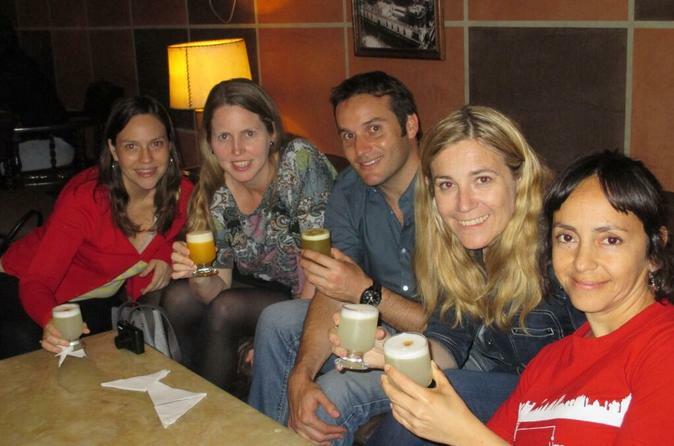 You'll interact with locals at a pub and delve into Lima's history. 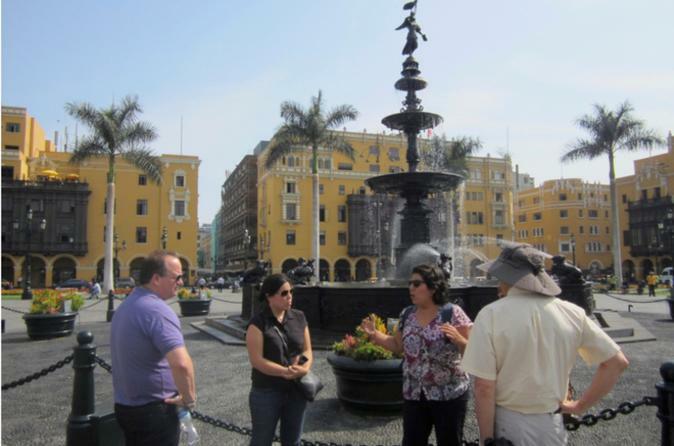 With a maximum of 12 people, this small group tour offers a personal experience while exploring the streets of Lima! 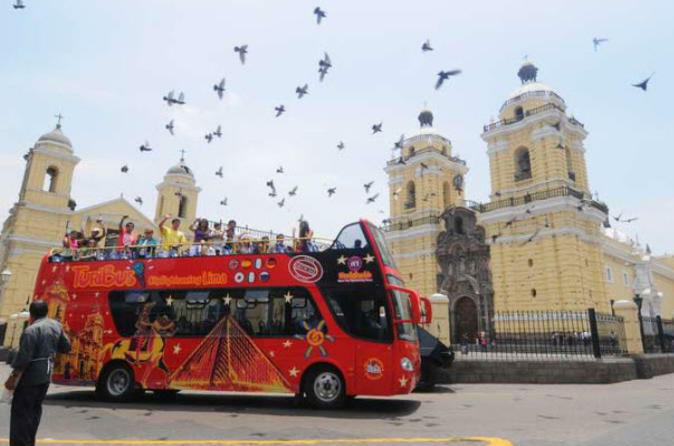 Discover Lima's rich history and beauty on this exciting City Sightseeing tour by open-top bus! Choose from two tour options, each giving you the chance to see some of the city's most famous landmarks. Visit the old historic center and the Monestary of San Francisco (Convento de San Francisco), see the neighborhood of Miraflores, and take in gorgeous views of the Pacific Ocean from Love Park (Parque del Amor). 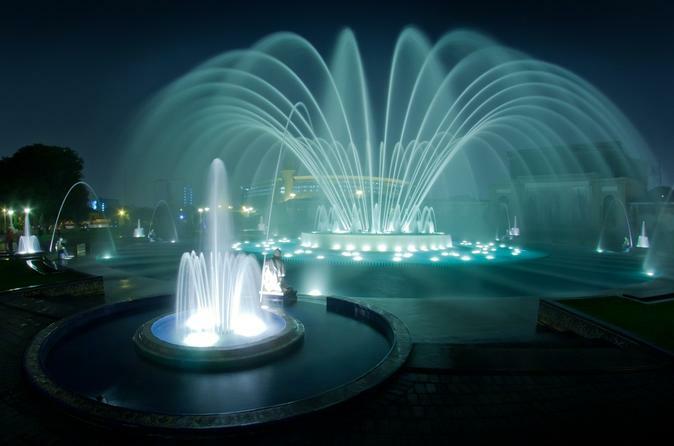 Opt for a night tour and see spectacular fountains. 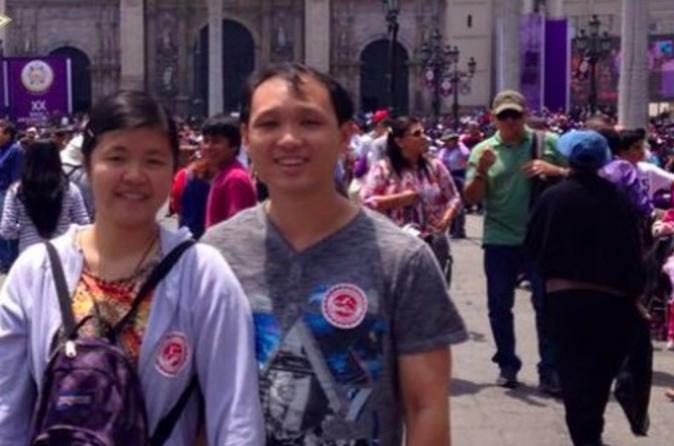 This open-top City Sightseeing tour is perfect for the whole family and is a great way to see Peru's capital city. Leaving Lima behind, you'll depart on a full-day tour to the Ballestas Islands and Nazca Lines. Visit the famous Ballestas Islands where you'll have the opportunity to observe the sea lions and birds in their natural habitat prior to continuing south to Ica. Then, board a small Cesna aircraft for a scenic air tour over the enigmatic Nazca Lines for an aerial experience of a lifetime! 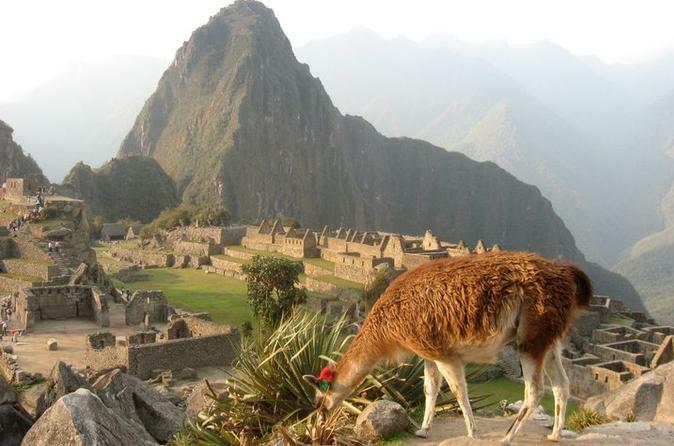 This full-day tour from Lima is a must-do when visiting Peru. Jump on a bicycle and see Lima in a different way! Ride along Lima’s sublime coast and take in its interesting heritage and artistic enclaves on a small-group cycling tour that includes stunning scenery. Experience Lima’s rich, expressive culture and discover vibrant neighborhoods on this fun and enriching ride that starts at Solar Hill and ends in cosmopolitan Miraflores. 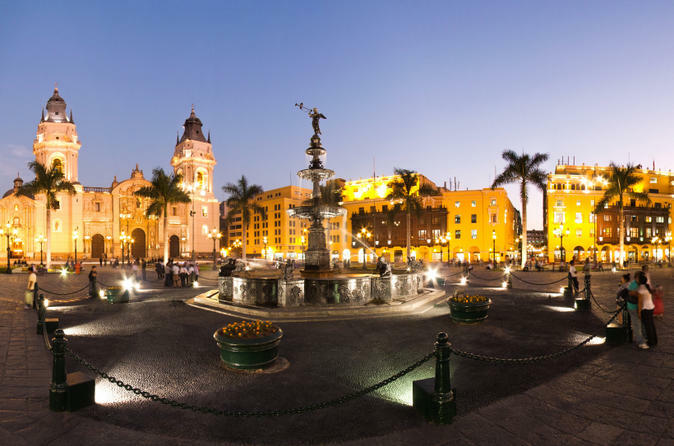 Experience two of Lima's top attractions on this evening tour. 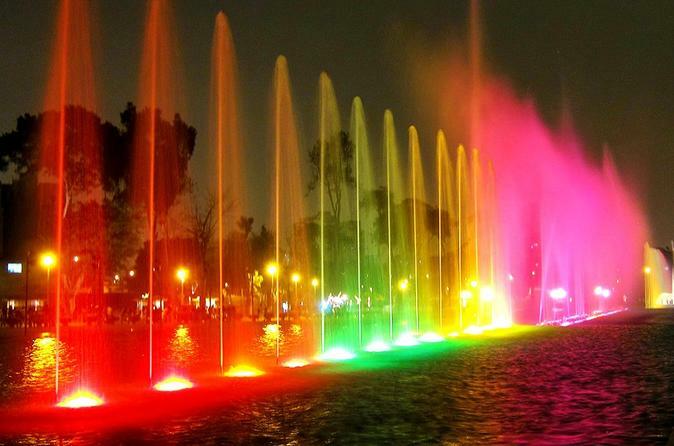 With your guide, first visit the Larco Museum (Museo Larco) to learn about pre-Columbian culture and see ancient artifacts like ceramics and pots, and then be wowed at the Magic Water Circuit (El Circuito Mágico del Agua), a spectacular water and light show in Lima’s Parque de la Reserva (Park of the Reserve). 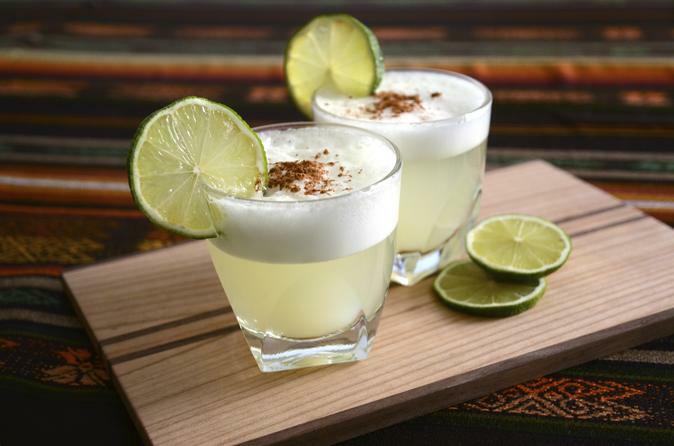 Between stops, visit a local tavern for a snack and a pisco sour (included). This 4-hour tour includes a visit to the market and a cooking class perfect for people who love traditional foods and want to make learn to make these dishes at home. You'll love the relaxed atmosphere with a hands-on approach. You will make an authentic Peruvian dish to tantalize your taste-buds and later enjoy your achievements. Get a taste of Lima’s downtown on this evening walking tour. You’ll visit small bars and street vendors abuzz with locals to sample typical Peruvian dishes and local drinks. Expect to try grilled meats, sweet corn desserts, and alcoholic beverages. Plus, learn about the history of Lima's oldest bars and enjoy their bohemian vibe. This guided tour is limited to 12 people, ensuring you enjoy a small-group experience. 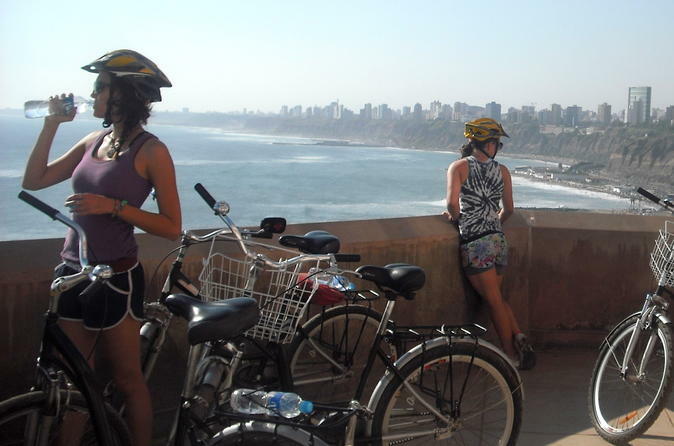 Discover the diversity of Lima behind its touristic facades on a friendly tour on two wheels. 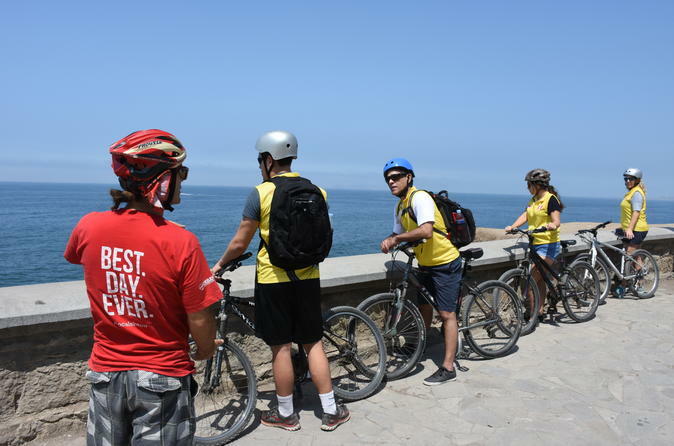 Biking along El Malecon de Miraflores (the cliffs) is one of the coolest things to do in Lima and hike El Morro in Chorrillos to see 360° panoramic view of Lima! Take a guided market tour, watch a cooking demonstration and discover the signature tastes of Peru: fish ceviche and the pisco sour cocktail. 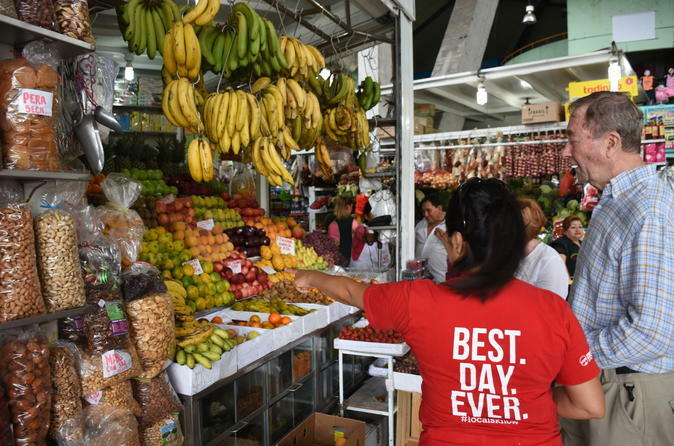 You'll visit a typical fresh produce market in Lima, and learn how to prepare Peru’s national dish and drink. Then sit back and relax, and enjoy a traditional Peruvian lunch at a local restaurant. Instead of dining out again, prepare and savor a home-cooked meal during your stay in Lima. 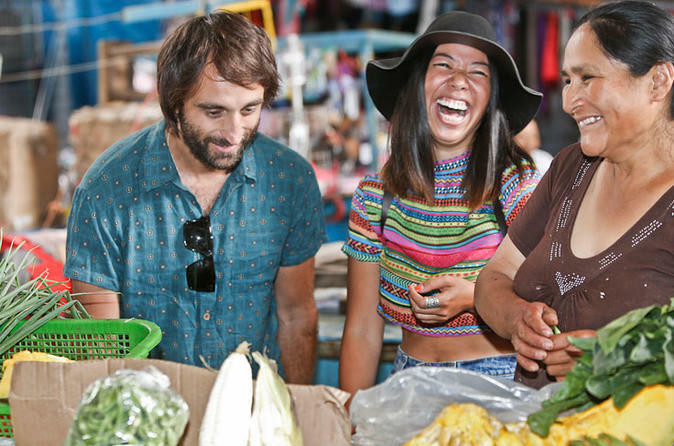 On this 4-hour guided cooking class tour, discover the unique spices of Peruvian cuisine at a bustling local market in Miraflores. Then take a city bus to a family home in a tourist-free neighborhood and take pleasure in whipping up Lima-fare favorites like ceviche, ‘chichi morada’ and ‘causa limeña.’ With a pisco sour in hand, settle in for a warm family meal. This small-group tour is limited to 12 people, ensuring a memorable experience. This is the ultimate food and city tour. It includes exclusive restaurants, trendy districts, top must-see attractions and hands-on activities. Make the most out of Lima in one day. Enjoy 5 stops spread between 3 districts that include a visit to an organic, Peruvian coffee roasterie, and a fruit tasting and tour at a local upscale market. 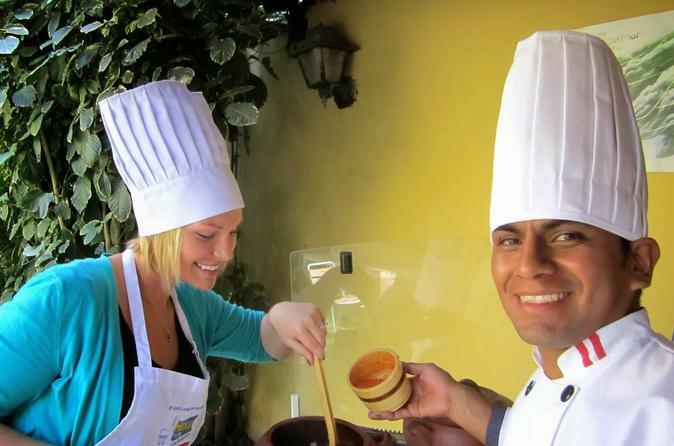 Have fun with a pisco tasting, hands-on cocktail class and cebiche class with a professional chef, and end the day with a gourmet lunch and dessert at a top restaurant in Lima with views of pre-Incan ruins. 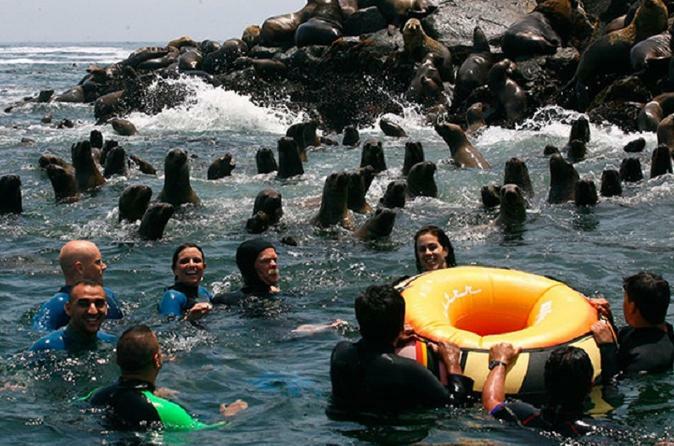 Come enjoy a 4 hour cruise to 4 different islands off of Lima with a swimming experience with sea lions. 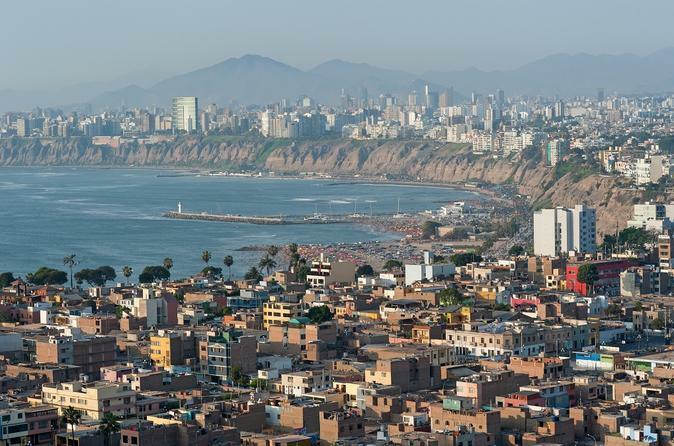 Get acquainted with Lima and learn why it became known as the "City Of Kings and Queens". 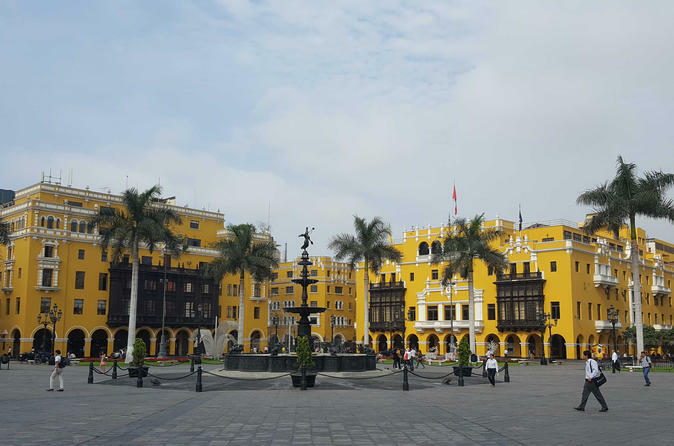 Along with your expert local guide, you'll tour Lima's fascinating historical center, from palaces to castles! Visit iconic attractions like the San Francisco Monastery, but also see a more hidden side of Lima. Round-trip transportation, all entrance fees and knowledgeable guide all included! 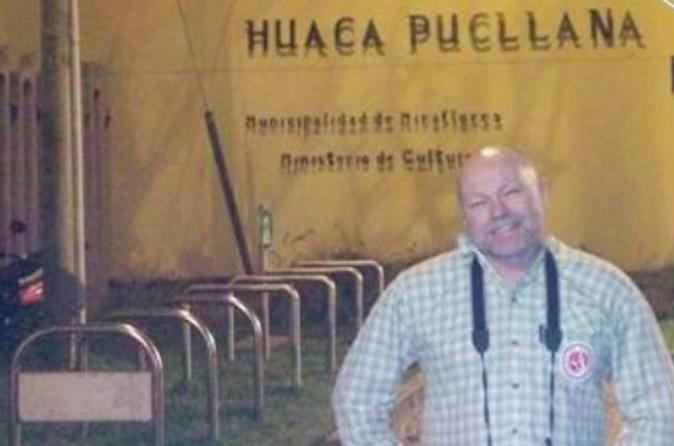 Want a small-group Lima tour truly off the beaten path? 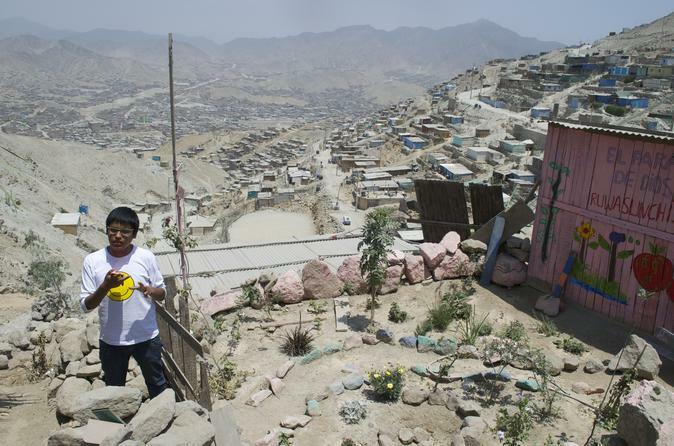 Want to get to know Lima beyond the touristic areas? Then this intercultural experience is what you're looking for. You have the choice out of two interesting morning programs. One takes you to a few alternative sights such as a small artisanal fish market and a historical heritage hill with a great view of Lima while the other allows more time and visits in the local community for a true intercultural immersion. Both programs include the visit to one of Lima's human settlements with a local guide, including the 2nd largest cemetery in the world, an NGO who does excellent work to improve life in some of Lima's poorest neighborhoods and an entrepreneurial local lady who has started her own fair trade business in her own house. You'll also have lunch at a local family where we'll share some stories with our hosts. 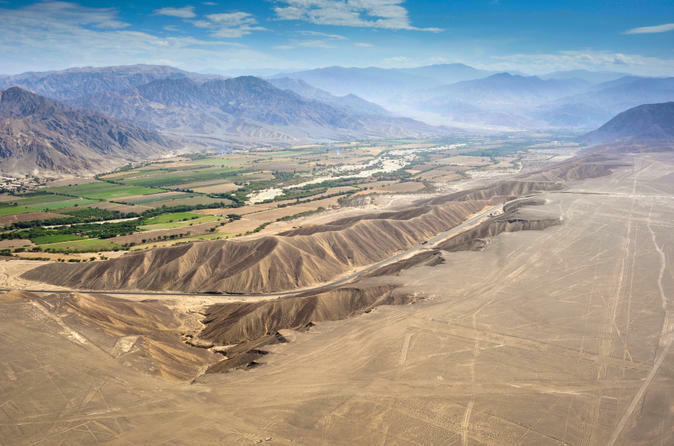 See the mysterious and awe-inspiring Nazca Lines from the air on this tour from Lima. After the drive down the Peruvian coast from Lima to Paracas, take off over the lines (or geoglyphs, to get scientific) aboard a Cessna plane. 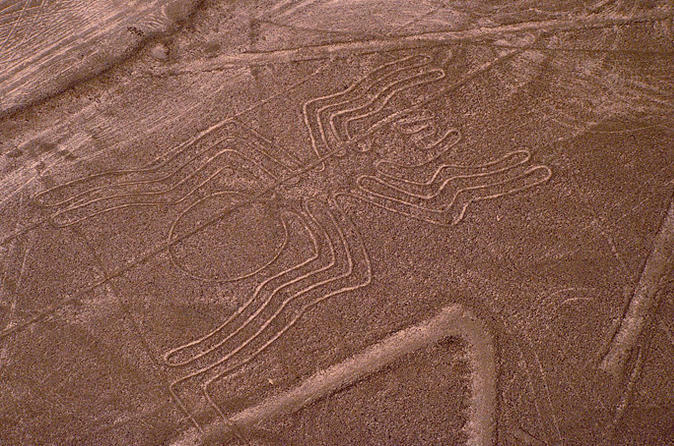 As you fly over the Nazca Desert drawings, a UNESCO World Heritage site, take aerial photos and form your own opinions about their ancient meaning — there are many hypotheses! You’ll be returned to Lima at the end of the day. 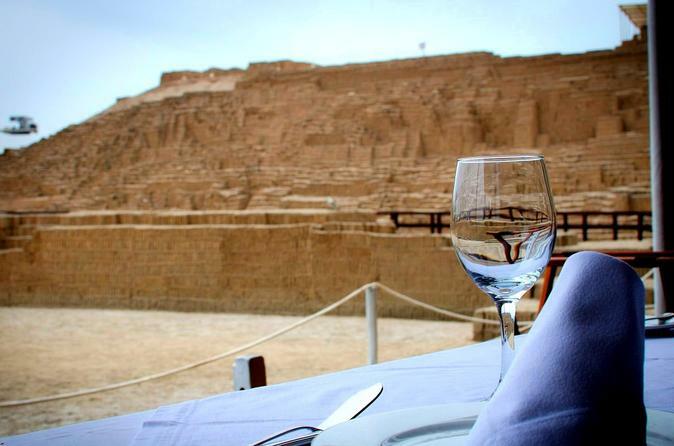 Explore pre-Incan ruins dating back to 200 BC right in downtown Lima! Long before stones were laid down to build Machu Picchu, the indigenous people of what is now Peru were constructing huacas (pyramid-like structures) for ceremonial purposes. Lima was constructed around these huacas, which means you won't have to travel far to see them! 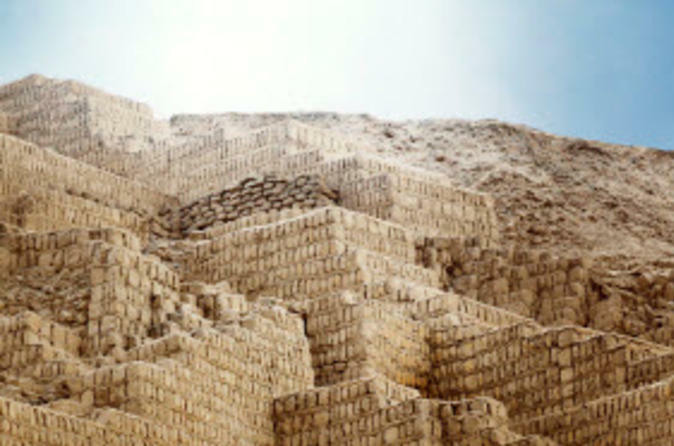 Your local guide will take you to two sites, Huaca Pucllana and Huaca Huallamarca, and provide historical insight into these temples that were built by the unknown 'Lima culture,’ an indigenous pre-Incan civilization. 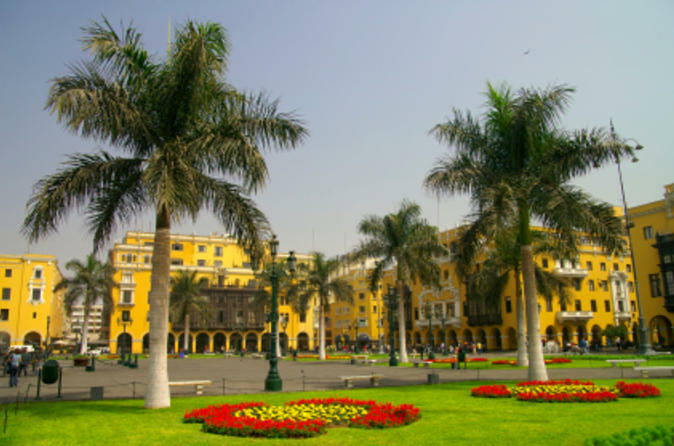 Discover what the historic city of Lima has to offer on a half-day private tour. Visit the eerie catacombs of the San Francisco Convent. 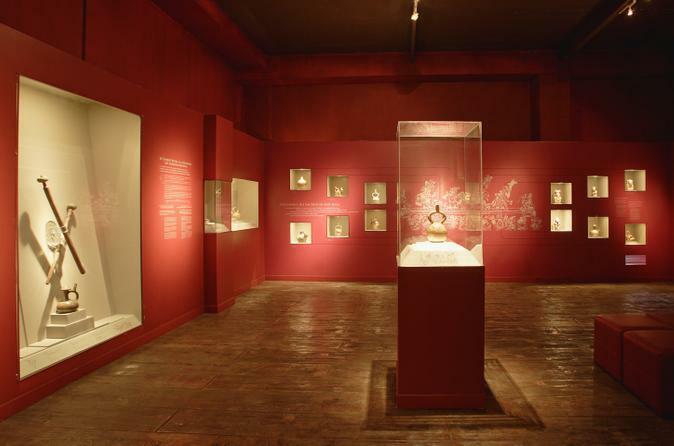 Learn about the history and culture of Peru from your knowledgeable guide as you admire delicate Nativity scenes at the Casa Luna, then finish with shopping for handmade goods at the Indian Market. 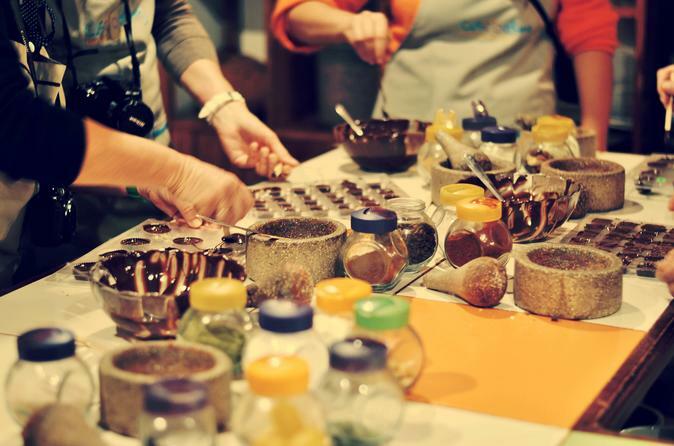 Learn how to make your own chocolate on a 2-hour workshop at the ChocoMuseo in Lima. This is a hands-on activity, starting from the cocoa tree to the finished product passing by every step of the whole chocolate-making process. Moreover, discover the history of cocoa and the reasons why Peru is known for its fine chocolates! The best of Lima in one evening: from a trendy beachfront cocktail demo at sunset, to gourmet Amazonian dishes and a secret jungle cooking lesson, see the sights and taste the flavors of Peru’s history and culture through its cuisine. Try exquisite local recipes below the stars amid illuminated pre-Incan ruins and walk the bohemian streets of the Barranco district. 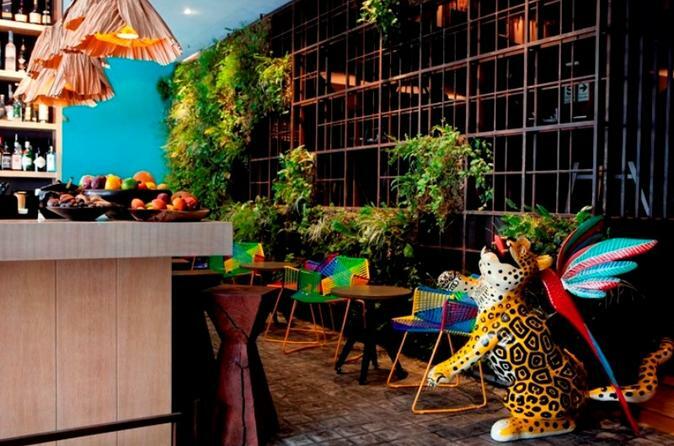 Hands-on, laid back and chic you’ll get a feel for a different side of Lima. Enjoy a bike tour and have fun in a city full of wonders. 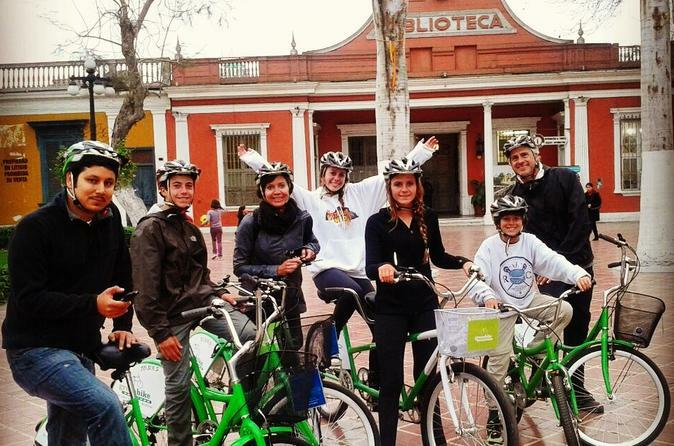 Cycle around 2 Pre-Inca pyramids in the middle of Miraflores and San Isidro neighborhoods. Visit El Olivar, a field composed of olives and explore La Costa Verde, of the bohemian Barranco. Stop for a traditional empanada and lemonade in a restaurant (included in your tour) and taste why Peruvian food is so good. 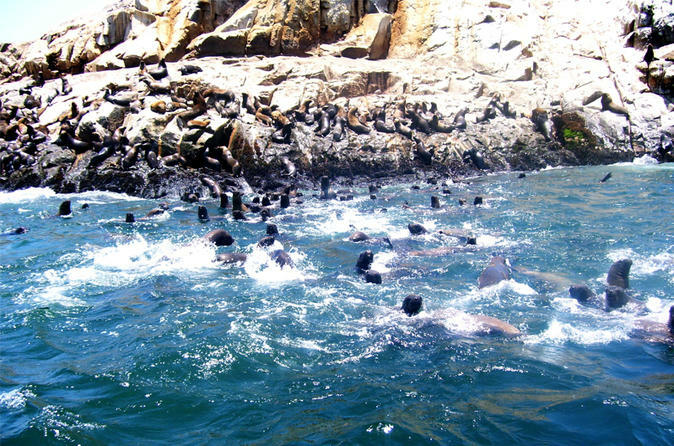 Enjoy a fascinating boat ride and visit Palomino Islands, located facing the city of Lima. Learn about their interesting history and have the unique chance to dive in the water and swim with curious and friendly sea lions. Additionally, you will be able to spot a variety of birds and even penguins in their natural surroundings. Your tour includes transport and a professional guide. This tour is a perfect introduction to Lima’s most charming and trendy neighborhoods including the famous promenade locally known as “El Malecon”, cool and arty hot spots, pristine parks, cozy plazas, Barranco’s old town, the best kept secrets of Miraflores, inspiring old and new architecture plus breathtaking cliff-side views of the Bay of Lima. 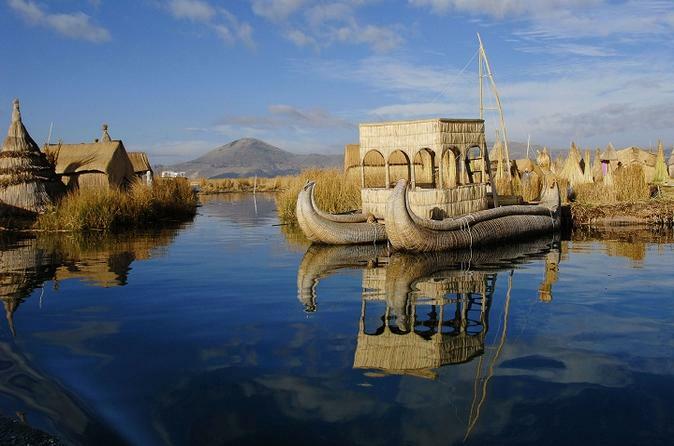 Enjoy a fascinating 12-day tour in Peru, visiting the main attractions including Lima, Ballestas Islands, Nazca Lines, Cusco, Machu Picchu Puno, Titicaca Lake and more. Your tour includes a professional guide and accommodation. 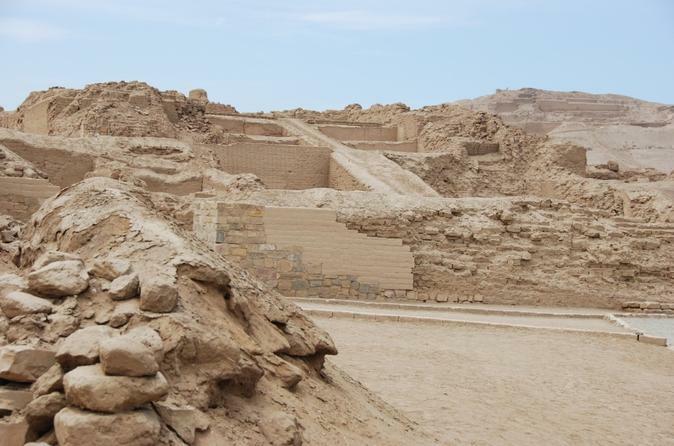 Enjoy a guided tour of the archaeological site of Pachacamac from Lima. You will visit its main temples and then go to the Barranco district and admire the views of the Pacific Ocean. Your tour includes hotel pickup and drop-off on a private vehicle. 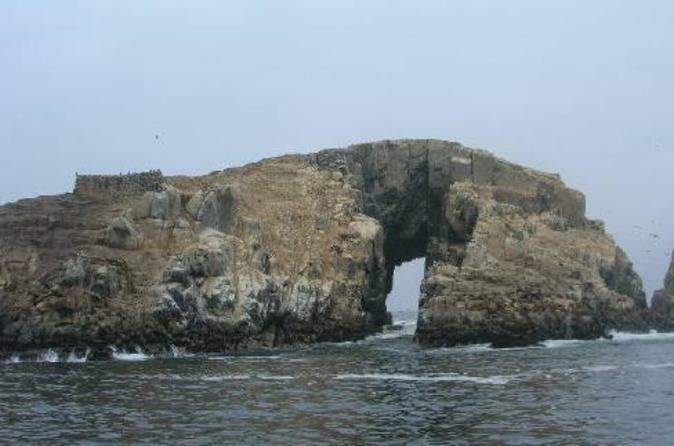 Enjoy a morning boat ride out to the islands of Lima -- Palomino, Cabinzas and El Frontón. After a 30-minute boat ride, you'll arrive at the islands with your local guide and enjoy up-close looks at historic sites and local wildlife like birds and sea lions. This relaxing boat ride offers you an escape from the city and a chance to see the scenery and wildlife of the Pacific coast. 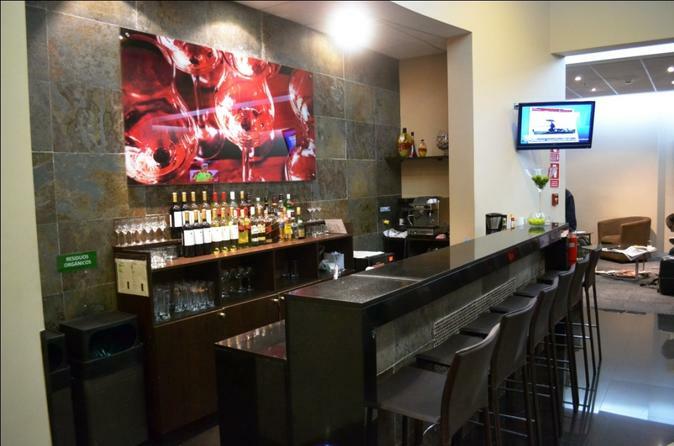 Want to relax before flying from Jorge Chavez International Airport? Then book your access to a quiet and elegant retreat in one of the airport’s three lounges, and unwind in peace before boarding your flight. Sink into the plush seats, help yourself to the buffet and beverages, take a refreshing shower, and wallow in the calm and civilized atmosphere before your flight call. Plus, choose the length of access you want from the options available to suit your schedule. 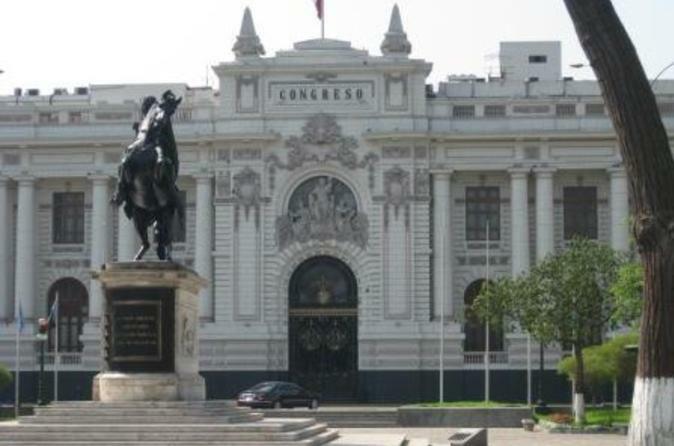 Enjoy the best of Lima's landmarks on this 3.5-hour private, afternoon tour. See the city's architecture, squares, churches and catacombs and top-off the evening at the Magic Water Circuit at the Reserve Park. Marvel at the several impressive fountains, lights, music, and even holograms. Your tour includes private transport and guide. 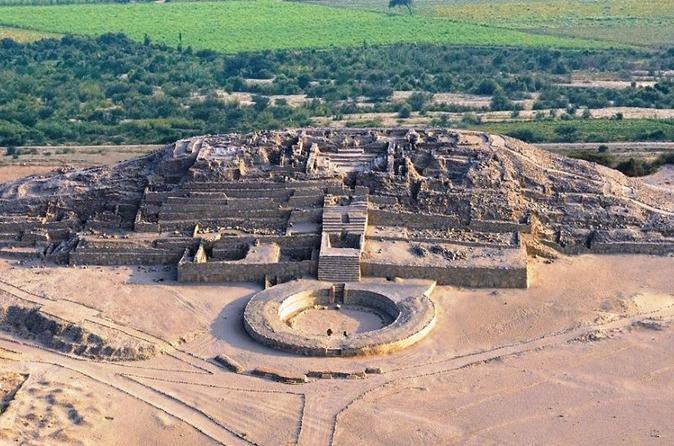 Discover Caral on this day tour to one of the oldest cities in the world. This private tour will give you a great insight into this ancient city. Enjoy the beat of the south of the capital city of Peru. Connect with Lima riding along the districts of Barranco and Miraflores and experience a countless number of colors, flavors and sounds, which make this city a very special destination in South America. 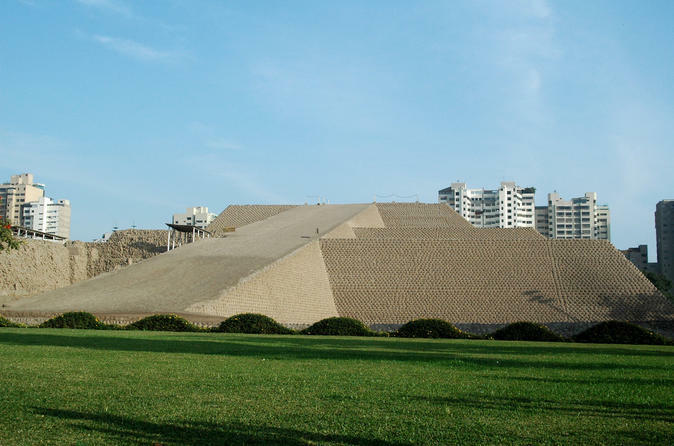 On this half-day, small-group tour you will visit the most important landmarks of the city of Lima including “Huaca Huallamarca,” a pre-Inca adobe pyramid. You will also visit Larco Museum, try a delicious desert at Cafe del Museo, and visit historical downtown Lima, a UNESCO World Heritage site. Observe the change of guards at the Government Palace and admire Convento de Santo Domingo. This 4.5-hour tour includes entrance fees, a snack, hotel pickup and drop-off and a professional guide. 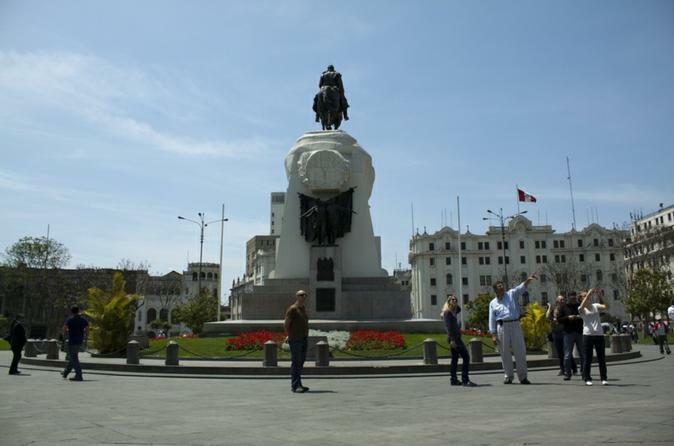 Enjoy Lima on this private tour with professional English-speaking guide. 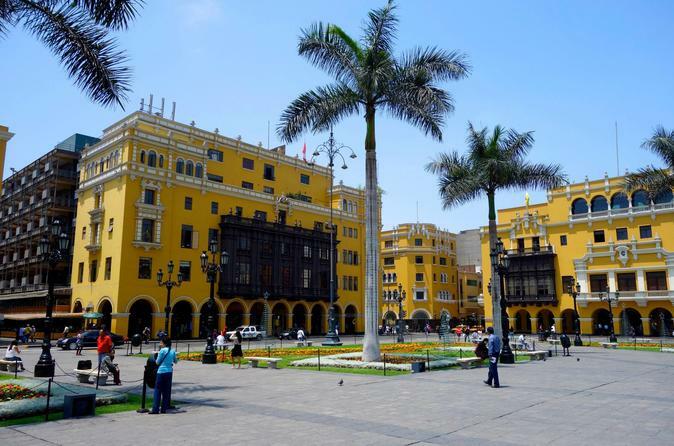 See major landmarks and squares such as Plaza de Armas, the Government Palace, Huaca Pucllana and more. Visit San Francisco Convent and its catacombs.